Summertime is winding down and we are seeing the Back to School consumer frenzy begin. Parents, watch out! Soon enough you’ll be running around hunting down the very specific college-ruled loose-leaf paper, 0.7mm lead pencils, and numerous composition books, spiral-bound notebooks, and graph paper notepads. But before we join the madness, let’s take a moment to highlight a very bright CSF student, Osvaldo Vargas. Osvaldo has been a scholarship recipient since the 1999-00 school year, the first year that CSF offered scholarships. His mom, Ms. Vargas, was aching to send him to private school because she admired the discipline and teaching offered in the private school setting. Her wish became a reality when a friend told her about the CSF scholarships. As soon as Osvaldo, her eldest, graduated from PreK, she applied and was awarded a scholarship. Osvaldo continued with the scholarship all the way through his 8th grade graduation from Our Lady of Refuge School in 2008, and now, thanks to the high school scholarships provided by CSF’s partner, The Endowment for Inner-City Education, Osvaldo has two successful high school years under his belt. He’ll enter 11th grade this fall. CSF regularly receives his report cards, which all boast an average of 85 or higher. Ms. Vargas tells us that Osvaldo loves math and hopes to pursue a career in engineering or computer science. And Osvaldo’s most recent report card – scoring a 92 in Geometry – shows us that he’s well on his way towards reaching his goals. Keep up the great work, Osvaldo! Ms. Vargas is surely proud of Osvaldo’s accomplishments, but she also notes the success of her two other children, Melissa (8th grade) and Osmar (2nd grade), who use CSF scholarships to attend Our Lady of Refuge. Melissa also loves math and dreams of being a pediatrician. She tells us how much she loves her school, saying, “[It’s] fantastic! I like the teachers. They keep you working. They tell you never to give up.” She’s also so grateful for her scholarship. “Without the scholarship I wouldn’t be where I am now,” she says. Now, let’s have a great end of summer, and get ready for an exciting new school year. At the recent Trey Whitfield 18th Annual Awards Banquet, CSF had the pleasure of meeting Jessie Zhan, a stellar CSF scholarship recipient, who was honored at the dinner as one of twelve academic honorees (CSF President Darla Romfo was one of the adult honorees). Jessie has been a CSF Scholar since 2006, when she transferred from public school to attend Transfiguration School in Chinatown. She will begin 8th grade in the fall, and she has come a long way. Jessie was born in the heart of the hustle and bustle of New York City, but soon after her birth, her mother took her to China to live with her grandparents. Not long after her return to the U.S. to begin Kindergarten, Jessie was already making her mark. At 5 years old, and with the gracious help of her grandpa, she won first place in her Chinese school’s character recitation contest. She also recently won first place in an essay contest where she wrote about the environment and how we can make it better. Her mother (a single parent raising Jessie and her older sister, Teresa) says the scholarship has been immensely helpful to her family financially, and also for Jessie’s academics. She says her grades have improved and that Jessie is deeply motivated to do well, knowing that she has a scholarship to attend her school. Now that Jessie is gearing up to finish her elementary school years at Transfiguration, she continues to set her goals high. She hopes to be admitted to one of the prestigious specialized high schools in NYC, such as Stuyvesant. For the post high school and college years, she is already considering a career in teaching. She firmly believes in the value of education and the importance of developing the youth of today to be the leaders of tomorrow. With Jessie’s determination and goal-setting, we have no doubt that she will accomplish great things. Congratulations to Jessie for all her success! 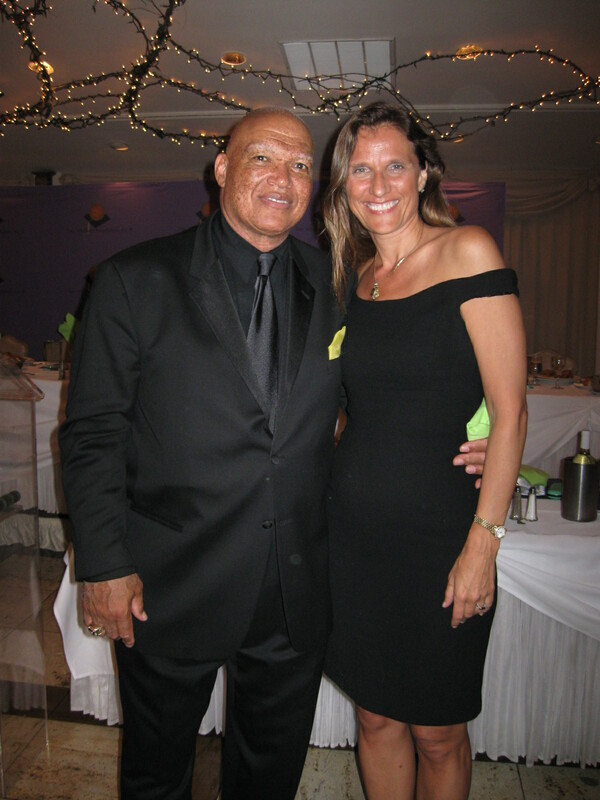 Last Friday night was warm and humid outside, but inside Brooklyn’s El Caribe Country Club the air was cool, the fairy lights were glowing, the music was smooth, and the stage was set for a terrific benefit for the Trey Whitfield School. Among the six adult honorees was CSF President Darla Romfo. Darla was selected as a role model for Trey Whitfield students because of her work at CSF, offering a quality education to thousands of children. Other adult honorees included: NBA Hall of Famer Rick Barry; Darryl Dawkins of the Philadelphia 76ers; Brooklyn District Attorney Charles J. Hynes; Carra Wallace of New York’s Office of Executive Initiatives, and Boston Celtics forward-center Rasheed Wallace. More than 400 lucky children attend the Trey Whitfield School, and the school’s work and mission are definitely a reason for celebration!